Pack your bags, it's time to hop on the next aeroplane and head to a luscious tropical island! 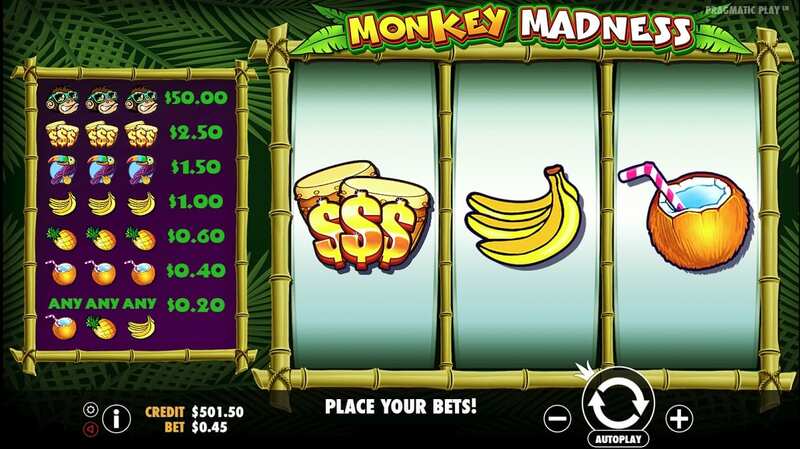 Monkey Madness is a 3 reel, 9 payline casino online slots which has a tropical, retro theme. Paradise awaits. You'll be able to sunbathe the beach all day while listening to tropical birds tweet. Your view will be spectacular; calm crystal blue seas and soft sandy beaches. Of course, you need the obligatory fruit cocktail while you soak up the sun. Monkey Madness is filled with entertaining features which include free spins and bonuses. Be sure to look out for the wilds as they will help you win the top prize of £5,000. The monkey is also there to help you create lots of winning combinations throughout the game. 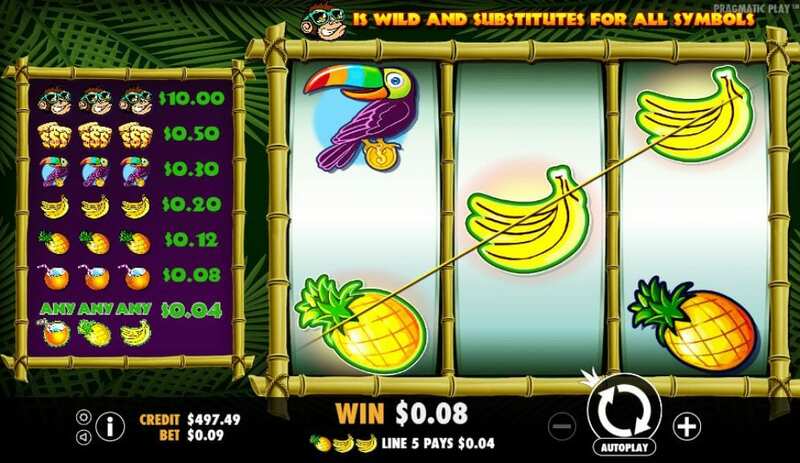 Check out slots games here created by Pragmatic Play on Wizardslots! Monkey Madness is just like your typical fruit slot, but with a unique tropical twist. 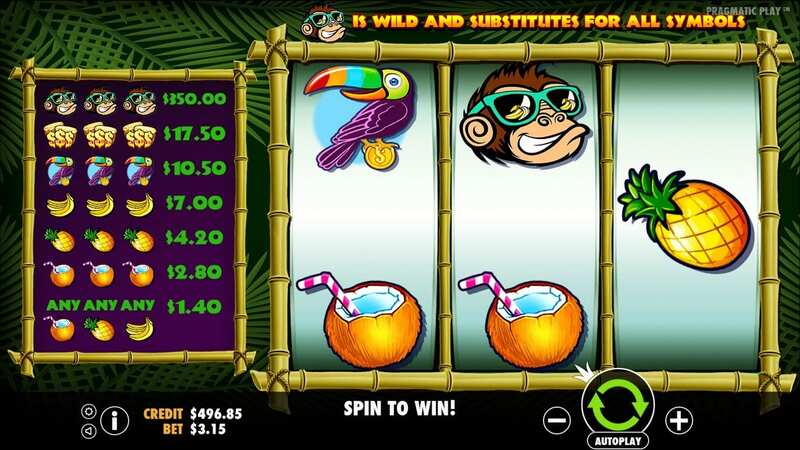 This 3 reel, 9 payline slot has a vibrant and cheerful design and jungle audio to go with the theme. Behind the reels, there are big green jungle leaves. Bamboo is twisted around the reel to give it a wild jungle vibe. The cartoon symbols all fit the tropical theme well and include a cool monkey wearing sunglasses, delicious cocktails in coconuts, juicy pineapples, bananas, sweet strawberries, tasty kiwis, tropical birds and bongo drums. We've created a guide with helpful tips if you want to play top 10 best slots today! The Wild Symbol - The wild symbol in Monkey Madness is the monkey. There aren't many features in this slot, it's quite an easy game to play. You simply have to match 3 fruit symbols to create a win. Look out for the Monkey Madness wilds as these will help you create big wins. Landing 1 monkey symbol will triple your stake. Landing 2 will award you with a 9x multiplier and landing 3 will award you with the top prize of £5,000.